It is still unclear exactly how gender influences vote choice. Using an information processing perspective, we argue that instead of directly influencing vote choice, candidate gender guides the amounts and types of information that voters search for during a campaign, and that effects of gender on vote choice ultimately come from differences in information search influenced by candidate gender. Using two unique experimental datasets, we test the effects of candidate gender on vote choice and information search. 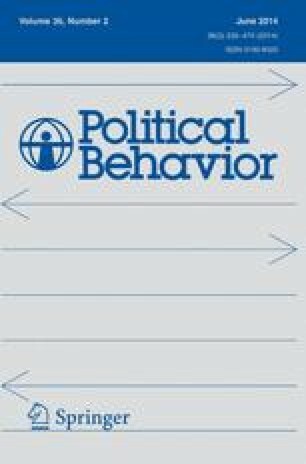 We find that subjects change their search based on a candidate’s gender, seeking out more competence-related information about female candidates than they do for male candidates, as well as more information related to “compassion issues.” We also find that evaluations of candidates’ traits and issue positions are important predictors of subjects’ vote choice. The online version of this article (doi: 10.1007/s11109-013-9232-6) contains supplementary material, which is available to authorized users. The authors gratefully acknowledge National Science Foundation grants in partial support of these studies including SBR-9411162, supporting data collection for Study 1, and SES-0647738 and SES-1022551, supporting the further development of the Dynamic Process Tracing Environment software. Thanks also to David Andersen and Richard Lau for their help with the design and programming of Study 2, as well as Tracy Osborn, Caroline Tolbert, and Jason Windett who read early versions of this article and provided helpful comments.